Normal operational hours of the building are 8am – 6pm Monday – Friday. Typically during operational hours reception is staffed and there is a facilities management team available. Please be aware of the relevant information within the health and safety induction notes. In particular note the fire service and university security services will not attend a fire alarm during weekday office hours. Should the alarm go off at such a time they must be explicitly called before they will attend (using a call point break glass unit is a human action and thus counts as calling for assistance unlike smoke and heat detectors etc). 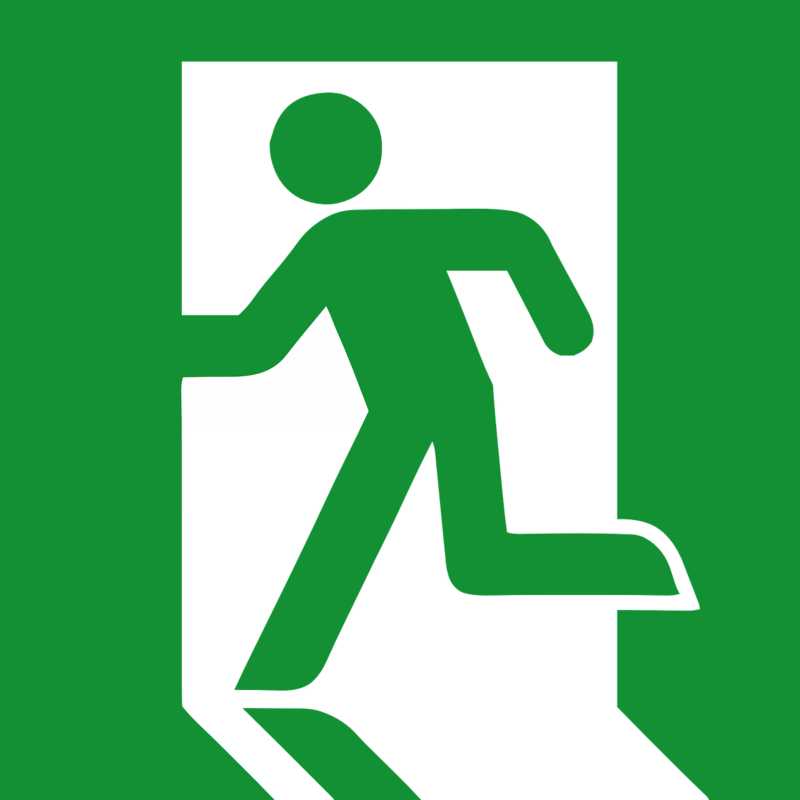 Please familiarise yourself with the location of emergency exits and whenever the alarm goes off always evacuate the building by following the running man emergency exit symbols. The running man symbols will direct you to the nearest fire safe stair core (cores 1 & 2 in the north wing and cores 3 & 5 in the south wing), through the core to the ground floor and out the fire safe corridor/link to the fire exit. In general you should not be evacuating via the atrium stairs or main mezzanine stairs as those routes could expose you to higher risks from smoke and fire. The 3 lecture theatres have additional fire exits at the front of the room where you should again follow the running man symbols which will take you through the basement area and into the fire safe core stair cases, up to ground level and out the fire safe corridors/links to the fire exits. Some fire exit routes may require the use of a green break glass button to release a locked door. This will trigger the intruder alarm but is the correct action if the fire/evacuation alarm is sounding. Note there are safe refuge points on each level in each stair core. Each such point is equipped with a yellow break glass unit that will trigger an alert so that appropriate personnel or the fire service are aware and can act. There are also evac chairs in each stair core which can be useful in some situations. In the event of an evacuation the assembly point is marked at the far side of the Triton Fountain in the Humanities Building courtyard. Please make sure when you evacuate the building you completely clear the Penrose paving area (where you naturally exit if coming via cores 2 and 3 out through the fire exits either side of the main entrance). If you exit the building via cores 1 and 5 you will come out of the building at the very ends, where you then need to come around the building and in to the Humanities courtyard. Note it is not generally practical nor appropriate for individuals to be charged with physically checking through the building in the event of such an evacuation. Such checks might still be performed in unusual circumstances. In the event of a false alarm, test or cleared issue FM or OUSS staff will generally announce it is safe to return and instruct people to re-enter the building. Whilst incidences inside the building that require evacuation are uncommon, people are generally familiar with the need for building evacuation and drills to practice this. An even more rare situation outside the building could lead to largely the opposite need, an invacuation and/or lockdown. In such a situation there is a need to keep everyone inside and safe. In an invacuation scenario FM staff and others would staff building exits and make all those inside the building aware they should not currently leave. If there were a need for a lockdown to prevent people entering the building then the building access control system can be put into out of hours mode (card and pin access) or even into a mode that would prevent any access. The building alarm can also be put into a mode such that all external entry/exit points are alarmed and trigger the alarm if opened. You can email facilities-management@maths.ox.ac.uk or phone 70087 to contact the FM helpdesk to report general building issues and matters. The FM helpdesk service is open 8am-5pm Monday to Friday. You can also report issues to reception who will inform the FM helpdesk or local FM staff as appropriate person. Should you need to see the FM staff in person the local team are based in S0.43. There are also FM staff based in N0.20 which is the site wide ROQ FM office. To report an emergency issue, particularly out of hours, please phone (out of hours the phone number redirects to the primary key holders, security services, who will in turn contact relevant people). Please immediately report lost university cards to door-entry@maths.ox.ac.uk. A replacement card can be requested through the personnel staff in S0.11 and S0.13 at a cost of about £10. Reception can issue a short term temporary card for building and office access or arrange for someone to let you in to your office as appropriate. Lost property should be reported to reception (either in person or via email to reception@maths.ox.ac.uk). They in turn may report the matter to University Security Services who may ask you to contact Thames Valley Police for a crime reference number. Any found items should be handed in to reception. Items can be reclaimed by attending reception with proof of identity and a suitable level of information about the lost item. Out of operational hours if there is an urgent incident in the building please contact Security Services who are the primary key holders for the building and who will also liaise with other key holders and contacts as appropriate depending on the issue. Note also Security Services have an ROQ site security office that is part of this building and is room N0.15 on the ground floor of the north wing. For non emergency matters out of hours please report issues in the normal way as appropriate, e.g. to facilities-management@maths.ox.ac.uk, it-support@maths.ox.ac.uk or other individuals as appropriate. Please contact us for feedback and comments about this page. Last update on 27 October 2015 - 10:49.